Despain was born on November 5, 1984, in Rosario, Argentina, and grew up in Provo, Utah. Her father is from Utah and her mother is from Argentina. During high school she was a gymnast and ballroom dancer. She earned an associate’s degree from Utah Valley State College (now Utah Valley University) in 2004 and her bachelor’s degree in psychology from Brigham Young University in 2006. 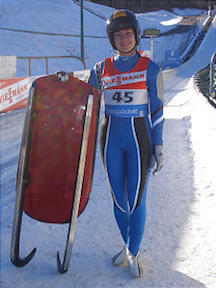 She began competing in luge in 2003. She finished 29th in the women’s singles at the 2005 FIL World Luge Championships. Despain is married to former Olympic luger Christopher Hoeger. She is a member of The Church of Jesus Christ of Latter-day Saints. This page was last edited on 24 April 2017, at 16:10.